I've got a new running partner. He's kind enough to go my speed -- he doesn't go too slow, and although he's always just a bit ahead, and makes me work a bit harder than I would solo, he never takes off out of sight. He's always willing to trust my route selection and come along, rarely whining or complaining. And although I like dogs and they make great running partners, too, he never snags my snacks while I'm not looking, or chases skunks. The true environmentalist, he even packs out his own waste! He's just under 3 months old. I'm now able to go running outside with my boy thanks to a very generous and thoughtful gift of a jogging stroller from our awesome friends in the Fort Collins Trail Runners. Seriously, this was an incredible gesture for our little family. We've already got it great, with a beautiful happy, healthy baby making us smile with his goofy laughs and giggles. It's also been a mad, emotional and financial scramble for several months, going from 0-to-baby in no time, but NO complaints, knowing how hard and nerve-wracking it can be for anyone going through the difficult uncertainties of adoption or pregnancy. We've already had incredibly generous support from family and friends, with plenty of new and used clothes and toys and other basics to get us started. While Mama J has been focused on getting his nursery ready -- tipping from a delicate emotional point of not having any time before he was born to bringing him home -- I've been wondering, how do I get him outside, comfortably and enjoyably, to appreciate the vibrant sights, sounds, and smells of his wonderful world? So while I might not have been as excited by the comprehensive 'Must-have' list provided by Baby Registry services (how did babies survive just a few decades ago? ), the main long-term indulgence I hoped for was a nice running stroller. 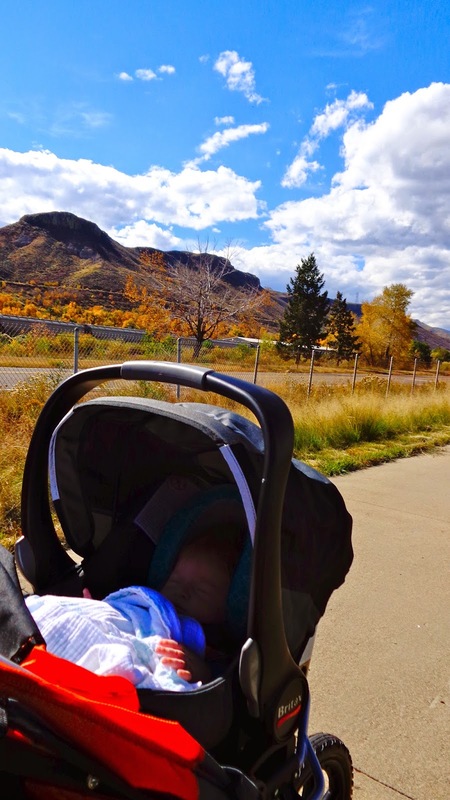 Our friends came through, just in time for one of the best stretches of October weather in Colorado since we've lived here, with the BOB Sport Utility stroller. So far, it's been fantastic. I guess this is a short review. One of the main questions for a parent runner is, "Which stroller?" There are several options, and I knew BOB makes some great ones. Among those, you have the "Ironman" version, which is high-quality but built for (racing) pavement. I definitely leaned towards the off-road versions, which have 16-inch pneumatic tires and shocks to be able to go over moderately rough terrain and bumps. The last debate was the Sport Utility, which has a fixed-front wheel (with all 3 wheels being 16" diameter), vs. Revolution, which has a smaller front wheel that rotates side-to-side ("yaw"), but is more expensive, and lacks a handbrake. 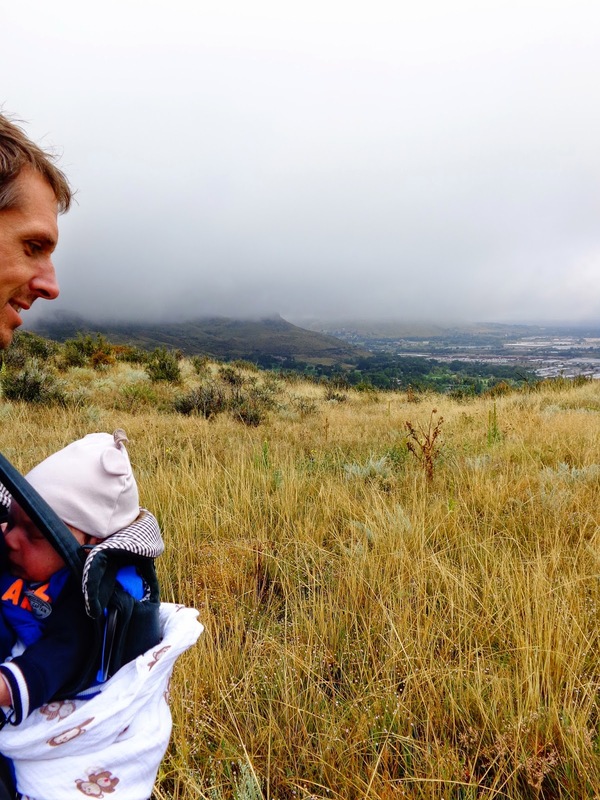 The consensus I found is that the Sport Utility Stroller really is more of a hiking and running stroller -- several trail runners I spoke with recommended this model -- whereas the Revolution might be slightly easier to maneuver through malls and more for jogging. So we registered for the the Sport Utility Stroller and it's been a great choice. I've needed and used the handbrake on steeper downhills already. In addition to preferring the cushioning of the larger front wheel, I've patched a tire already (not bad, as I went through patchy weeds in goathead season) and bought some replacement tubes from a local bike store, and it would be more troublesome to have to keep or bring 2 different tire sizes. As for turning a fixed front wheel: you wouldn't want it to be able to turn on any sort of bumpy terrain, as every rock would knock it sideways, but on flat areas it's an easy shift-of-weight backward, and then a quick pivot on the rear tires. With practice (i.e., one run), you can do this at-speed. I do understand that there's an even more expensive version of the Revolution with a handbrake (or maybe it can be added), and there might be more adjustment on the handlebar height. If the latter is important, it might be worth checking out. Otherwise, from what I can tell, based on the first hundred miles: BOB Sport Utility Stroller FTW. Last up is colour, and you can choose any colour you want...as long as it's a Denver Broncos colour! So, orange or blue. Both are sharp looking. I went with orange because I thought it would be easier to see. Safety first! But wait, there's more! Young infants cannot stabilized their own heads yet. They're most secure when still in their car seat, which may have additional cushioned neck support in it. Luckily, most decent jogging strollers have adapters for car seats, so that you can click a rear-facing carseat into the stroller. In the case of BOB, you can get adapters for different car seat brands. Confusingly, BOB carseats are made by Britax, which means you need a Britax adapter to mount the carseat to a BOB stroller, making the "adapter" sound like a misnomer when you have both items being BOB brand. In truth, the "adapter" is actually a mounting bracket that supports the carseat. But still, extra $$$. The other question is about jogging with infants at all, especially on bumpy surfaces. Like all parenting issues, their are strong opinions and occasionally contentious debate. There are numerous anecdotes of people running with weeks-old babies that turn out just fine, and no known population evidence otherwise. Some have a misguided fear of "shaken baby syndrome" (SBS) but the terribly violent jerking of SBS (generally forward-to-backward) is vastly different than anything encountered in a reasonable stroller ride. Millions of kids deal have dealt regularly with bumpy transport. And, ironically, we're very accepting as a society of the incredible risk of simply driving on the roads each day, yet people question anything outside of average behaviour. Using a stroller for running, and on trails, then, is mostly common sense. Even with nice shocks, you can't fly over bumpy or rutted trails. And with the carseat adapter, the center of gravity is higher, so you also do have to be a bit more careful as it rocks side to side and you have a smaller baby. So on most rocky stuff, I'm at or near a walk, and the best trails are still relatively flat dirt, gravel, or paved trails. Still, the cushioning of a nice running stroller is much better than a basic stroller with small, hard wheels. The overall verdict of running with a baby so far? Luckily, babies are not shy about letting you know how they feel. My son will mostly sleep, quite peacefully, and occasionally look around or at me. It's obvious to tell the difference between when he's displeased or content, so it's obvious to know to slow down for anything really bumpy or rocky, and otherwise he's quite happy to be outside. He'll occasionally fuss when trying to fall asleep, no different than being in a car, and a pacifier usually fixes that as he falls right back asleep. If he's awake, and when we're done, I'll talk to him and make sure he smiles. Which he always does -- he's a pretty happy guy anyway. I had nothing on the schedule after Bighorn. And that nothingness was great. The Bighorn finish means I have 2 more lottery years of eligibility for Hardrock. That's the long-term goal. I've calmly accepted that I'll get my chance eventually, and that each run or hike -- especially when it's uncomfortable -- is another training step for Hardrock. I was able to get some good rides on the mountain and road bike instead this summer. But the most fun I had running was up by Cameron Pass, on a great weekend of scouting for Gnar Runners' Neversummer 100k slated for July next year. Since I'll still probabilistically not get into HR this coming year, which is fine, I'm excited about races like that, as well as some more hikes/runs and mountain bike rides. 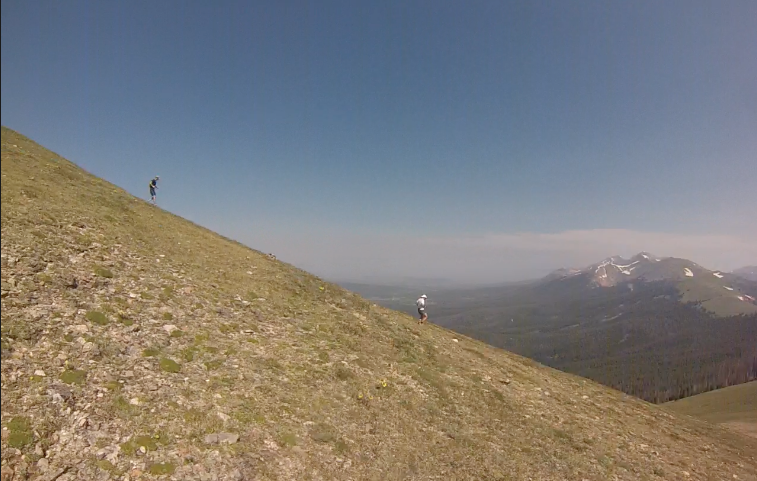 The Neversummer 100k has the potential to be a phenomenal event on a very inspiring course. The only thing better than tromping through those mountains and woods will be doing it with friends and family cheering and hanging out at campfires. Can't wait! A handful of other 100's otherwise hold my interest, but at this point it's clear that I won't spend many more years running these things, and certainly not racing them. I can finish them comfortably, with a smile on my face, but am not able or willing, for better or worse, to push into that realm of competitiveness at that distance. I've had some incredible experiences and gotten more than I ever thought out of it, but I'll focus more on variety. 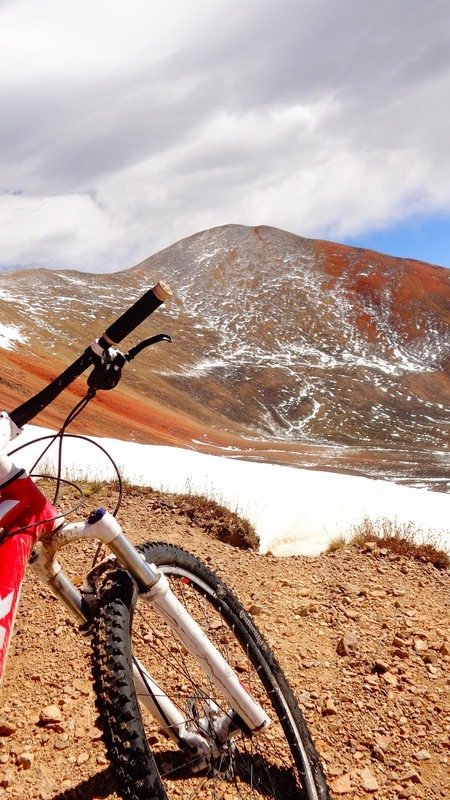 Hope to be on the skis and bike more -- and taking some slower, family-friendly hikes -- instead of looking too far forward. Once again, I'm quite behind in blogging, and have a few fun weekend trips (mostly mountain biking) worth writing up eventually. But otherwise, I need to tell the universe that I am absolutely stoked to be running the Bighorn 100 on Friday! First and foremost, I'm incredibly excited and lucky to have this chance again. I'm not planning on doing 100-milers for the rest of my life, and even that much longer, so there's a short list of inspirational races and courses that I'd really love to experience. Bighorn is very near the top of that list. 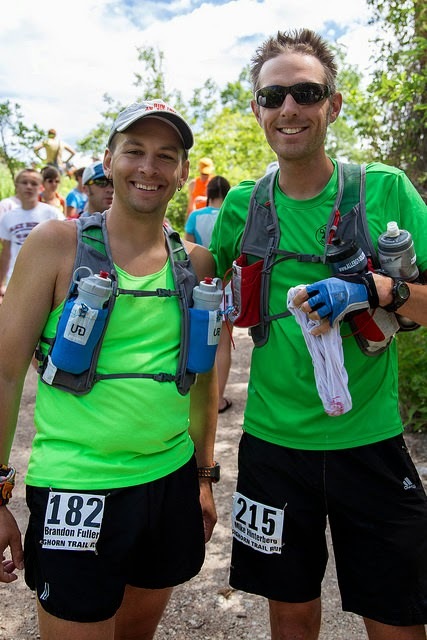 Numerous folks have mentioned how great it is...Alex said it's probably the most beautiful course he's seen, and let's not forget it was a spry and youthfully naive Nick Clark's introduction to 100 milers. And earlier this year, while jogging across a windy expanse near Boulder/Superior (during a winter Fatass), Dana K. told me it was the most beautiful wildflowers she's ever seen. Compared to Crested Butte? Aspen Four-Pass? San Juans? Yes, yes, and yes. Wow. I've been near the Bighorn Mountains once, --12 years ago -- when we were moving to California. Anxious to get to Yellowstone, I made a last-minute decision to take the dotted-line "scenic route" on the map instead. Having never really seen mountains, it was the most incredible thing I'd even seen. (And it actually made Yellowstone a comparable disappointment once I saw all the crowds and traffic). Never would I have imagined, at the time, that I would come back and have a chance to run 100 miles through that terrain! Pretty sure I had never run more than 3 or 4 miles -- on sidewalks -- at that point. I'm also lucky to be out there with my friend Chris S., who has run every distance at that race. And he has graciously offered to pace me! the woods. Again. I hope they enjoy another random weekend in a beautiful part of the world. I'm certainly looking forward to numerous friends from across the Front Range -- running, pacing, and crewing -- that will be out there as well. Some will be ahead of me, some near me, some behind me, and in each case it will be great to see familiar faces in addition to meeting new ones. Lastly, I'm very excited about the vibe of the race -- the small town, the community, the support. Check out the NYTimes article from 5 years ago. It feels like the anti-Leadville, the anti-Western states -- even if I like/love those races, the pressure and scrutiny and traffic gets to be a bit much. This sounds more like my speed: a chill race and a shared sense of wonder and appreciation for the natural surroundings. More like my training runs. And a small-town feel that I'm more comfortable with.